Travel the globe to uncover the Roses of Athena! In Samantha Swift and the Hidden Roses of Athena, archeologist and adventurer Samantha Swift is on a quest to recover the Scepter of Zeus for The Museum of Lost Secrets. She doesn’t realize she’s about to stumble upon one of the greatest archeological finds of all time! Unfortunately, she also runs into greedy treasure hunter Ravena Stryker. As Samantha Swift, you’ll use your keen sense of observation to uncover treasures around the globe and unravel the mystery of the Roses of Athena in this hidden objects adventure game. Together with associates Dr. Norwynn Butler and Adam Woodson, you must be cautious to guard the shield from falling into the wrong hands - Ravena and her benefactor are always watching you! 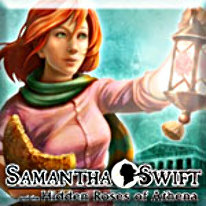 Unravel the historic mystery in Samantha Swift and the Hidden Roses of Athena!